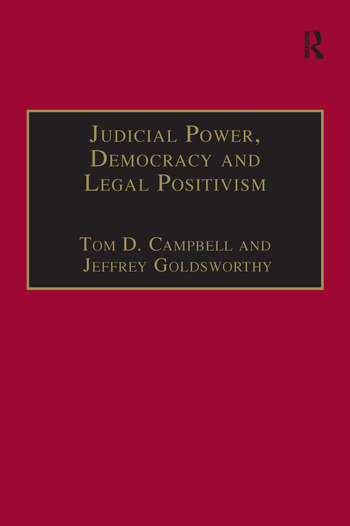 In this book, a distinguished international group of legal theorists re-examine legal positivism as a prescriptive political theory and consider its implications for the constitutionally defined roles of legislatures and courts. The issues are illustrated with recent developments in Australian constitutional law. Contents: Reorienting Legal Positivism: Democratic aspects of ethical positivism, Tom Campbell; ; Ethical positivism and the liberalism of fear, Martin Krygier; Feminist perspectives on ethical positivism, Nicola Lacey; Legal separatism and the concept of the person, Margaret Davies; Positivism and difference, Helen Stacy; Is legal positivism committed to Intentionalism?, Natalie Stoljar; A perspective theory of law, Walter Sinnott-Armstrong; Legal positivism and the contingent autonomy of law, Fredrick Schauer. Assemblies v. Courts in Democratic Theory and Practice: The philosophical foundations of parliamentary sovereignty, Jeffrey Goldsworthy; Legislation by assembly, Jeremy Waldron; Defining judicial restraint, John Daley; A patchwork quilt theory of constitutional interpretation, Walter Sinnott-Armstrong; Citizenship, race and adjudication, Margaret Thornton; The vice of judicial activism, Arthur Glass; The role of law and the role of lawyers, Tim Dare; Judicial activism and the rule of law in Australia, Leslie Zines; Judicial activism and judicial review in the high court of Australia, George Williams; Index.